But who gets to keep the voters? August 02, 2016, 2:44 p.m.
Labour are currently in the middle of their second leadership contest within the last twelve months. Our polling before the contest began suggested that Jeremy Corbyn would have a solid lead over Owen Smith, but that was before Smith was identified as the sole challenger, and before the two-day window for supporters to register for a vote. Whatever way the leadership election plays out the future of the Labour party is at stake. Many have speculated about the potential for a Labour split – if the right of the party ultimately fail to oust Jeremy Corbyn would they leave (or if the infighting continues, be deselected?). If Jeremy Corbyn were to be removed, would the tens of thousands of newly enthused members go their own way? There seem to be irreconcilable differences within the Labour party, yet neither side wants to cede control of Labour to their opponents. Were the Labour party to split there would be some clear practical advantages for the faction that was left in control of the Labour party – they would keep the Labour party’s assets and property, their campaigning data and arguably much of the “Short money” (state funding for opposition parties based largely on votes and seats won at the previous election). They may also gain a substantial amount of brand loyalty – there are presumably many voters out there who have always voted Labour and will back the Labour party regardless of whether it is currently under the control of the right or the left of the party. How big is that Labour brand loyalist vote? We did a test to find out. 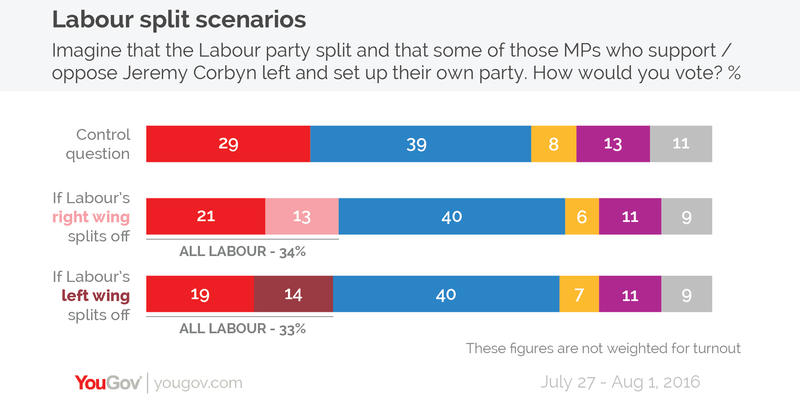 We asked respondents how they would vote if Labour split, offering respondents two scenarios: one where opponents of Jeremy Corbyn left Labour and set up their own party, the other where Jeremy Corbyn and his supporters ended up leaving Labour and setting up their own party. I should flag the caveats up front – people are not necessarily very good judges of how they would respond in hypothetical situations, and these are VERY hypothetical situations. Respondents wouldn’t know how many MPs went in each split, who would be the leader of the anti-Corbyn Labour faction or what specific policies the two factions would propose. Don’t take these as firm predictions of what would happen, just a straw in the wind. The levels of support for Labour and a splinter party seem to be roughly the same regardless of which side of the party leaves. In both cases we would see around 20% of the vote going to Labour, about 13-14% going to the splinter group. This underlines the advantage of being the faction that keeps control of Labour. There is something more than ideology or leadership appeal here – if the pro-Corbyn faction are left in control of the Labour party they get 21% compared to the rebels on 13%; if Corbyn’s opponents win control of the Labour party they get 19% compared to the Corbyn faction’s 14%. Breaking down Labour’s current voters they fall into four groups. 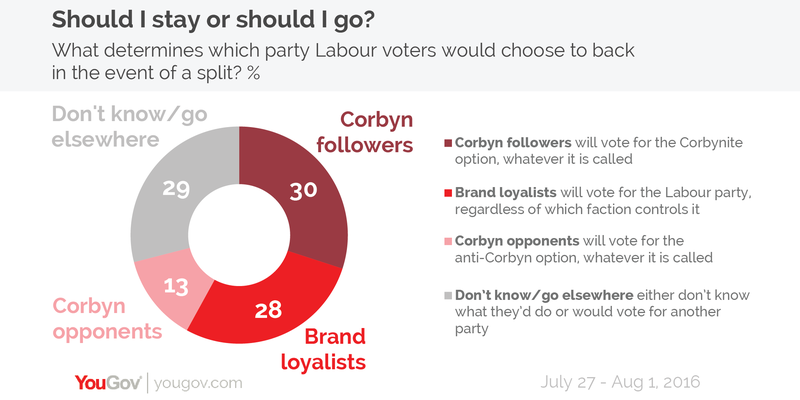 28% of current Labour voters are brand loyalists – they would back the continuing Labour party after a split, regardless of whether it was the anti-Corbyn or pro-Corbyn MPs left in control. 30% of current Labour voters would go with the Corbyn wing of Labour in the event of any split – if Corbyn stays leader they will vote Labour, if the Corbynites left they would vote for his rival party. 13% of current Labour voters are the opposite: in any party split they would go for whichever faction opposed Corbyn. The remaining 29% are less certain, and say they don’t know what they would end up doing in one or both of the scenarios, or that they would take their vote elsewhere. The proportion of the current Labour vote who stick with the Corbynite faction is larger than the anti-Corbyn faction… but that’s largely to be expected, these are current Labour voters and Jeremy Corbyn is the current leader. Were there to be a split an anti-Corbyn splinter party would also pick up support from respondents who aren’t currently voting Labour, giving them similar levels of support: about 13%-14%. I would urge some caution here, while it suggests both sides start with the same sort of base support we are not really comparing like with like: most respondents will have at least some idea of who Jeremy Corbyn is and what he stands for, but obviously can’t know who the leader of an anti-Corbyn split would be, or what policies they would focus on. It would be wrong to assume the 28% who stay with Labour regardless is purely down to blind brand loyalty – people may be sticking with the main Labour party in both scenarios because they think a splinter party is doomed under First Past the Post, or because they disapprove of splitters. 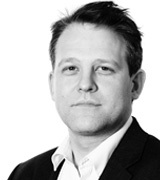 However, what seems clear is that the battle for control of the Labour party in the event of a split is about more than just the assets of the Labour party, whichever faction of the Labour party is left controlling the party name and identity will inherit a chunk of voters who are loyal to the Labour brand. However these figures also suggests that whichever side were to split from the Labour party would take a substantial minority of Labour’s support with them. Under the first past the post system, that may be fatal to Labour whoever is left in control. The two sides of Labour standing as separate parties win a little more support in total than Labour would standing as a single party. In a proportional electoral system this would be better for them… but in our current First Past the Post electoral system splitting the Labour vote this way would be disastrous for them unless their votes were strongly geographically concentrated. In conducting our tests, we obviously had to create some fake names for the splinter parties leaving Labour – both from the right and the left of the party. Given we were really interested in who stuck with Labour, we didn’t want to get misleading results because we’d accidentally come up with a very attractive name for the Corbynite splinter party or a particularly repulsive name for the Anti-Corbyn splinter party. To control for this we repeated the experiment three times using different dummy names – we tried calling the Corbynite party the “Radicals”, the “People’s Party” and “Momentum”, and calling his opponents’ party “Progress”, the “Moderates” and the “Social Democrats”. None of them made any significant difference to the overall result – whatever we called them our pro-Corbyn splinter party consistently got between 13% and 15%, the anti-Corbyn splinter party consistently got between 13% and 14%.